The research problem can be identified in the limitedness of the studies that allocate the comprehensive historic continuity of the Mesopotamian architecture during the Hera and sasanyain eras and at the architectural space level on the consideration that it is the heart of architecture in all its compositional and detailed items. Thus, the research aims at clarifying if there were any continuity in the Mesopotamian architecture during the Hera and sasanyain eras, and consequently, clarifying the levels of this continuity if it were on the whole or part level in architecture, then, identifying the changes that it has been through in order to know how to achieve continuity of contemporary architecture along its historical course. In order to verify this hypothesis, the architectural space has been studied. This study has managed to specify the items of the spatial continuity in the Mesopotamian architecture at the level: 1-	The spatial formation 2- the spatial relations 3- the architectural elements 4- the detailed treatments Moreover, the research has reached the general conclusions and it recommends a number of recommendations at the applicable, academic and epistemological level شهدت العمارة الرافدينية منذ بداياتها الاولى في حضارات وادي الرافدين المتعاقبة مرورا بالحضارة الاسلامية وحتى مطلع القرن العشرين سلسلة من الطرز المعمارية المتعددة خصها الباحثون والاثاريون والمؤرخون بدراسات وفيرة سواء على مستوى الحقب التاريخية او على مستوى الانماط الوظيفية او الطرز المعمارية وحتى على مستوى العناصر المكونة لتلك الطرز. لكن يمكن تشخيص المشكلة البحثية محدودية في الدراسات التي ترصد العمارة الرافدينية خلال مملكة الحيرة والحكم الساساني المواكب لها. لذا يهدف البحث الى توثيق وتحليل العمارة الرافدينية في مملكة الحيرة والمدن التي ظهرت في نفس الحقبة التاريخية وعلى مستوى 1-	التشكيل الفضائي 2-	العلاقات الفضائية 3-	العناصر المعمارية 4-	المعالجات التفصيلية. يعتمد البحث الدمج بين المنهج الوصفي والمنهج التحليلي المقارن في تقصي عمارة المرحلة وتحليلها على المستويات الاربعة المكونة للفضاء المعماري انفة الذكر، ومن ثم بدأ البحث بالتقصي عن بدء ظهور المفردات المعمارية والتغيرات الحاصلة فيها واختفاء مفردات وظهور اخرى مع جداول تحليلية توضح الحقب وانواع الابنية ووظائفها. وتوصل البحث الى استنتاج يخص كل مكون من مكونات الفضاء على مستوى التشكيل الفضائي، العلاقات الفضائية، العناصر المعمارية، المعالجات التفصيلية. وشخص البحث تواصل كل من تلك المفردات مع مفردات واساليب معالجات العمارة الرافدينية القديمة وكما سيرد توضيح ذلك في الاستنتاجات النهائية للبحث. In this paper, the static analysis for finding the best location of boxes inside the composite wing-box structure has been performed. A software ANSYS (ver.11) was used to analyses the Aluminum wing to find the maximum stresses reached in. These results are used as a base for the composite wingbox to find the numbers of layers and location of the box beam and its dimensions so that the composite wingbox may carry the same loading conditions in the Aluminum wing. Analysis showed that a composite wingbox having two boxes is better than the single or triple boxes wing based on stress to weight ratio. Mass saving of (40%) had been achieved when composite wing-box is used instead of Aluminum wing. يتضمن البحث ايجا د افضل موقع للصندوق داخل الجناح الصندوقي المركب من خلال التحليل السكوني للهيكل. أستخدم برنامج (ANSYS11) لايجاد اعلى اجهاد يتحمله جناح الالمنيوم. هذه النتائج استخدمت كأ ساس في تصميم الجناح الصندوقي المركب لايجاد عدد الطبقات وموقع وابعاد الصندوق وبذلك سوف يتعرض النموذج لنفس الحمل المسلط على الجناح القياسي. بينت التحاليل بأن الجناح المركب الحاوي على صندوقين افضل من الأحادي و الثلاثي و ذلك اعتمادا على النسبة بين الإجهاد / الوزن وان النقصان الواضح في قيمه الكتله عند استخدام الجناح الصندوقي المركب بدل من جناح الالمنيوم القياسي كان بمقدار(%40). Curing of concrete is the maintenance of a satisfactory moisture content and temperature for a period of time immediately following placing so the desired properties are developed. Accelerated curing is advantages where early strength gain in concrete is important. The expose of concrete specimens to the accelerated curing conditions which permit the specimens to develop a significant portion of their ultimate strength within a period of time (1-2 days), depends on the method of the curing cycle. Three accelerated curing test methods are adopted in this study. These are warm water, autogenous and proposed test methods. The results of this study has shown good correlation between the accelerated strength especially for the proposal curing test method and normal strength using normal curing method at ages 7 and 28 day for the five different chemical composition of cement with different water to cement ratios equal to 0.45, 0.55, 0.65 and 0.75. Linear and nonlinear regression analysis show high correlation for the different types of the accelerated curing methods with coefficient of correlation (R2) more than 0.9 معالجة الخرسانة هي من أجل المحافظة على كمية الماء المناسبة و درجة الحرارة لفترة من الزمن مباشرة بعد عملية الوضع من أجل تطوير الخصائص المطلوبة. المعالجة بالطريقة المعجلة هي مفيدة عندما يكون من المهم الحصول على القوة المبكرة. تم دراسة النماذج الخرسانية المعرضة الى المعالجة المعجلة من أجل الحصول على الجزء الاكبر من قوتها النهائية خلال فترة تتراوح بين يوم و يومين بالاعتماد على طريقة المعالجة. أعتمدت ثلاثة طرق في المعالجة المعجلة و هي طريقة الحمام الدافئ , طريقة التعجيل الذاتي و الطريقة المقترحة. أظهرت النتائج علاقة جيدة بين المقاومة المعجلة و خاصة الطريقة المقترحة مع 7 و 28 يوم للخرسانة المعجلة أعتياديا للخمس أنواع سمنت مختلفة التركيب الكيمياوي و لنسبة ماء الى سمنت تساوي 0.45, 0.55 , 0.65 و 0.75. الموديلات الاحصائية الخطية و غير الخطية أظهرت علاقة جيدة للطرق المختلفة للمعالجة المعجلة مع معامل أرتباط لا يقل عن 0.9. Frequently, Load associated mode of failure (rutting and fatigue) as well as, occasionally, moisture damage in some sections poorly drained are the main failure types found in some of the newly constructed road within Baghdad as well as other cities in Iraq. The use of hydrated lime in pavement construction could be one of the possible steps taken in the direction of improving pavement performance and meeting the required standards. In this study, the mechanistic properties of asphalt concrete mixes modified with hydrated lime as a partial replacement of limestone dust mineral filler were evaluated. Seven replacement rates were used; 0, 0.5, 1, 1.5, 2, 2.5 and 3 percent by weight of aggregate. Asphalt concrete mixes were prepared at their optimum asphalt content and then tested to evaluate their engineering properties which include moisture damage, resilient modulus, permanent deformation and fatigue characteristics. These properties have been evaluated using indirect tensile strength, uniaxial repeated loading and repeated flexural beam tests. Mixes modified with hydrated lime were found to have improved fatigue and permanent deformation characteristics, also showed lower moisture susceptibility and high resilient modulus. The use of 2 percent hydrated lime as a partial replacement of mineral filler has added to local knowledge the ability to produce more durable asphalt concrete mixtures with better serviceability. أظهرت بعض الطرق المبلطة حديثا بالخرسانة الاسفلتية قي بغداد وباقي محافظات القطر تدهورا مبكرا بالاداء نتيجة فشل الكلل والتشوهات الدائمية وفي بعض الاحيان نتيجة الفشل تحت تاثير الدور المخرب للماء. ان استخدام الجير المطفأ في انتاج الخرسانة الاسفلتية ممكن ان تكون واحدة من الخطوات التي يمكن اتخاذها في اتجاه تحسين الخصائص (Ca(OH)2) المتعلقة بالاداء للتبليط الاسفلتي لجعله يطابق متطلبات المواصفة من خلال توفير المقاومة اللازمة لانواع الفشل المذكورة انفا. لقد تم في هذه الدراسة تقييم الخصائص الميكانيكية لخلطات الخرسانة الاسفلتية والتي تحوي على نسب مختلفة من الجير المطفأ وهذه النسب هي ( ٢,٥ ، ٢,٠ ،١,٥ ،١,٠ ، ٠,٥ ، ٠,٠ و ٣ % من وزن الركام)، وتمت الاضافة عن طريق الاستبدال الجزئي للمادة المالئة التقليدية ( مطحون حجر الكلس). حيث تم اجراء فحوصات الشد غير المباشر، المرونة الاستردادية، الحمل المحوري المتكرر وكذلك فحص الانحناء المتكرر للنماذج المختبرية والتي اعدت باستخدام النسب المثلى للاسفلت لتقييم الخصائص المتعلقة بضرر الماء ، معامل المرونة الاستردادي، التشوهات الدائمية وكذلك خاصية الكلل. لقد بينت النتائج بان استخدام الجير المطفأ يحسن الى حد كبير خصائص الاداء المتعلقة بضرر الماء وكذلك يحسن معامل المرونة الاستردادي ومقاومة التشوهات الدائمية والكلل. ان استخدام نسبة ٢% من الجير المطفأ كاستبدال جزئي للمادة المالئة التقليدية قد أضاف إلى الخبرة المحلية المتوفرة في هذا المجال إمكانية أنتاج خرسانة إسفلتية لاغراض التبليط بديمومة أعلى ومستوى خدمة أفضل. Low bearing capacity of weak soil under shallow footings represents one of construction problems. Kaolin with water content converges to liquid limit used to represent the weak soil under shallow footing prototype. On the other hand, fly ash, which can be defined as undesirable industrial waste material, was used to improve the bearing capacity of the soft soil considered in this research. The soft soil was prepared in steel box (36×36×25) cm and shallow square footing prototype (6×6) cm were used .Group of physical and chemical tests were conducted on kaolin and fly ash. The soft soil was improved by a bed of compacted fly ash placed under the footing with dimensions equal to that of footing but with different depth ratios. The results show that there is a noticeable improvement in the behavior of footing when improved by compacted fly ash. The improvement showed a decrease in settlement and increase in bearing capacity. The improvement ratio in bearing capacity was calculated by comparing the ultimate bearing capacity value when testing the kaolin alone with its value of kaolin improved with compacted fly ash at the same value of eccentricity. It is important to note that eccentricity values were chosen according to the rule of middle third of footing base(i.e.,e≤B/6). The improvement ratio was about (130%) in average value, that represent a good ratio of improvementتمثل قابلية التحمل الواطئة للترب الضعيفة اسفل الاسس الضحلة من أهم مشاكل الانشاء. استخدمت تربة الكاؤولين بمحتوى رطوبة يقترب من حد السيولة لتمثيل التربة الضعيفة اسفل نموذج الاساس الضحل كما تم استعمال مادة الفحم المتطاير وهي من مواد المخلفات الصناعية . تم استعمالها في تحسين قابلية تحمل التربة الضعيفة الممثلة بمادة الكائولين التجاري في هذا البحث.تم تحظير التربة داخل صندوق من الحديد بأبعاد( 36×36×25)سم مع نموذج لاساس مربع ضحل(6×6)سم . أجريت مجموعة من الفحوص الفيزيائية والكيميائية لمادة الكائولين ومادة الفحم المتطاير وتمت عملية التحسين من خلال عمل شق اسفل انموذج ألأساس الضحل وبنفس طول وعرض ألأساس وتم حدل مادة الفحم المتطاير فيه (عند محتوى الرطوبة ألأمثل) ولثلاثة اعماق مختلفة (D=B,D=2B,D=3B)، علما ان B تمثل عرض ألأساس.أ جريت مجموعة من فحوص التحميل على التربة قبل وبعد التحسين وبتحميل مركزي ولامركزي مع الأخذ بنظر الأعتبار قاعدة منتصف ثلث قاعدة الأساس اي e≤B/6))في التحميل اللامركزي. أستخدمت العلاقة بين الضغط المسلط على الأساس مع الهبوط الحاصل في الأساس لإيجاد مقاومة التحمل القصوى للتربة تحت تأثير الاحمال المسلطة ولكل انواع الفحوص. تم احتساب نسية التحسين في مقاومة التحمل من خلال مقارنة مقاومة التحمل القصوىلتربة الكاؤولين بمفردها مع مقاومة التحمل القصوى لتربة الكاؤولين مع مادة الفحم المتطاير ولنفس مسافة التحميل اللامركزي .اعتمد البحث على عدة معادلات خطية تقريبية لتفسير النتائج العملية للفحوص، وصل معدل نسبة التحسين الى حوالي (130%) وهو ما يعتبر نسبة تحسين جيدة بالنسبة الى مقاومة التحمل. Methanol --- diesel --- equivalence ratio --- engine speed --- brake power --- specific fuel consumption --- indicated thermal efficiency --- exhuast gas temperature. An experimental and theoretical analysis was conducted for simulation of open circuit cross flow heat exchanger dynamics during flow reduction transient in their secondary loops. Finite difference mathematical model was prepared to cover the heat transfer mechanism between the hot water in the primary circuit and the cold water in the secondary circuit during transient course. This model takes under consideration the effect of water heat up in the secondary circuit due to step reduction of its flow on the physical and thermal properties linked to the parameters that are used for calculation of heat transfer coefficients on both sides of their tubes. Computer program was prepared for calculation purposes which cover all the variables that affect such type of transient mechanisms. The effect of the power density in the primary circuit and the water flow reduction percentage on the average temperature build up of the water in the primary circuit was investigated. The elapsed time required for the primary circuit average temperature to reach a steady state value was also calculated. These calculations were supported with experimental measurements conducted on a standard cross flow heat exchanger apparatus. The experimental results were compared with the theoretical results for certain power density value at different flow reduction percentages which show a reliable agreement. This relative agreement was necessary to consider the mathematical model with certain assurance for calculating transient parameters for higher power densities that are out of apparatus ranges. The results proved that water average temperature build up in the primary circuit has sharp tendency when the percentage of flow reduction in the secondary circuit reach 25% of its nominal values تم أجراء تحليل عملي ونظري لمحاكاة ديناميكية المبادل الحراري من نوع الجريان المتقاطع أثناء الحالات غير المستقرة لنقصان جريان المبرد في دوراتها الثانوية. حيث تم أعداد موديل رياضي مبني على الفروقات المحددة لتغطية ميكانيكية عملية التبادل الحراري ما بين الماء الحار في الدورة الأساسية والماء البارد في الدورة الثانوية. أخذ الموديل بنظر الأعتبار تأثير زيادة تسخين الماء في الدورة الثانوية بسبب النقصان الدرجي لجريانه على الخصائص الفيزياوية والحرارية ذات العلاقة بالحدود المستخدمة في أحتساب معاملات التبادل الحراري على جانبي أنابيب المبادل الحراري. تم أعداد برنامج حسابي على الحاسوب الذي يغطي جميع العوامل المؤثرة لمثل هكذا نوع من ميكانيكية الحالات غير المستقرة. تم بحث تأثير كثافة الطاقة في الدورة الأساسية والنسبة المئوية لنقصان معدل جريان المبرد في الدورة الثانوية على زيادة معدل درجة حرارة الماء في الدورة الأساسية. تم كذلك حساب الزمن المستغرق لوصول معدل درجة حرارة الماء في الدورة الأساسية الى قيم مستقرة. هذه الحسابات تم تدعيمها بقياسات عملية تم اجرائها على جهلز مختبري لمبادل حراري من نوع الجريان المتقاطع. تم أجراء مقارنة بين الحسابات العملية والنظرية لكثافة طاقة معينة لنسب أنخفاض في معدلات جريان مختلفة وكانت نتائج المقارنة مقبولة. هذا التطابق النسبي كان ضروريا لأعتماد الموديل والبرنامج الرياضي في أحتساب النتائج لقيم كثافات طاقة أعلى من حدود تحمل الجهاز. النتائج برهنت أن زيادة معدل درجة حرارة الماء في الدورة الأساسية تأخذ ميلا حادا عند وصول قيم النسب المئوية لأنخفاض معدل الجريان الى 25% من قيمها الطبيعية. A friction stir spot welding (FSSW) process is an emerging solid state joining process in which the material that is being welded does not melt. In this investigation an attempt has been made to understand the effect of tool shoulder diameter on the mechanical properties of the joint. For this purpose four welding tools diameter (10, 13, 16 and 19) mm at constant preheating time and plunging time were used to carry out welding process. 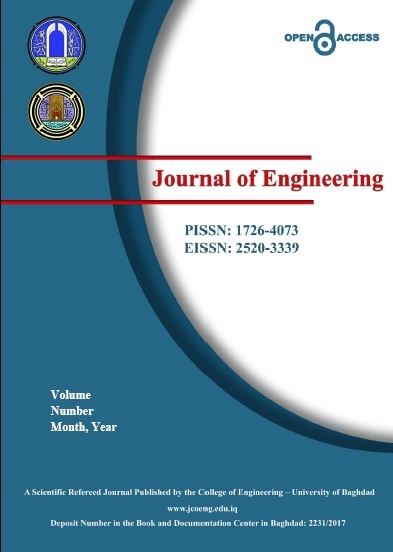 Effect of tool diameter on mechanical properties of welded joints was investigated using shear stress test and Microhardness of joint which welded was studied. Based on the stir welding experiments conducted in this study the results show that aluminum alloy (1200) can be welded using (FSSW) process with maximum welding efficiency (80%) shear strength using tool diameter(19mm) with rotation speed (900rpm). اللحام النقطي بالخلط والاحتكاك من طرق الحالة الصلبة والتي تكون فيها حالة المعدن الملحوم ليست منصهرة. في هذا البحث محاولة لفهم تاثير قطر العدة على الوصلات. لهذا الغرض استخدمت اربع عدد لحام ١٦،١٩ ) ملم لاجراء عملية اللحام في وقت تسخين وغرس ثابتين. ، باقطار ( ١٠،١٣ تاثير قطر العدة وقت اللحام على الخصائص الميكانيكية لوصلات اللحام تم بحثها باستخدام فحوصات الشد والصلادة المجهرية لوصلات اللحام . بناء على التجارب المختلفة في هذة الدراسة اتضح بان سبيكة الالمنيوم ١٢٠٠ ) قابلة للحام النقطي بالخلط والاحتكاك مع الحصول على اقصى آفاءة لحام وصلت الى ( ٨٠ %) اعتماد ا ) على مقاومة القص باستخدم قطر اداة ( ١٩ ) ملم مع سرعة دورانية ( ٩٠٠ دورة بالدقيقة ). A low speed open circuit wind tunnel has been designed, manufactured and constructed at the Mechanical Engineering Department at Baghdad University - College of Engineering. The work is one of the pioneer projects adapted by the R & D Office at the Iraqi MOHESR. The present paper describes the first part of the work; that is the design calculations, simulation and construction. It will be followed by a second part that describes testing and calibration of the tunnel. The proposed wind tunnel has a test section with cross sectional area of (0.7 x 0.7 m2) and length of (1.5 m). The maximum speed is about (70 m/s) with empty test section. The contraction ratio is (8.16). Three screens are used to minimize flow disturbances in the test section. The design philosophy is discussed and methods for wind tunnel calculation are outlined. Simulation of wind tunnel using ANSYS shows no separation of flow along wind tunnel. Construction steps are also included in present work تم تصميم و تصنيع و بناء نفق هوائي مفتوح واطى السرعة في قسم الهندسة الميكانيكية في كلية الهندسة – جامعة بغداد. يمثل العمل احد المشاريع الريادية التي تبنّتها دائرة البحث و التطوير في وزارة التعليم العالي و البحث العلمي العراقية. يتطرق البحث الحالي الى الجزء الاول من العمل و هو الحسابات التصميمية , التمثيل على الحاسبة والتصنيع، و سوف يتبعه جزء ثاني يتطرق الى اختبار و معايرة النفق. للنفق الهوائي المقترح مقطع اختبار مساحته ( 7,. x 7,. م2) و طول (5,1 م ). سرعة الهواء القصوى في مقطع الاختبار و هو فارغ تبلغ ( 70 م / ثا ). نسبة التخفيض في المساحة هي (8,16). تم استخدام ثلاثة مشبكات لتقليل الاضطراب في مقطع الاختبار. سوف تتم مناقشة فلسفة التصميم و طرق الحسابات المتبعة في البحث. تم تمثيل النفق على الحاسبة باستخدام برنامج ( الانسيز ) وقد بينت النتائج عدم حصول انفصال للجريان على طول النفق الهوائي. تضمن البحث الحالي ايضا خطوات البناء للنفق الهوائي. The rheological and fusion behavior of polyvinyl chloride (PVC) compounds plays a dominant role in the processing operations and in the development of physical properties in the processed material. A comprehensive study was made in this work to evaluate the effect of shear and thermal history on stability, mechanical and rheological properties of rigid PVC compounds. Different samples of Rigid Poly vinyl chloride including dry blend powder, granules, and bottles molded from both were examined. A study was also made on recycled RPVC where 25% of reclaimed material was continuously blended with fresh dry blend and processed for 15 cycles. Results showed that compaction of the PVC material took place in the brabender plastograph at constant temperature and shear stress. Correlations were given to explain results concerning residual stability and rheological behavior. Furthermore, it was seen that elongation and tensile impact are dependent on shear historyحيث ان لخواص الانصهار والانسياب لبوليمرات متعدد ( كلورايد الفاينيل) الصلب دورا حيويا في عمليات التصنيع وفي عمليات تطوير الخواص الفيزياوية للمنتج النهائي ؛ تمت اجراء دراسة شامله تناولت تاثير قوى القص والاجهاد الحراري المسبق على كل من الثبوتية وخواص الانسياب والخواص الميكانيكية لهذا البوليمر. شملت الدراسة اربع انواع من متعدد ( كلورايد الفاينيل) الصلب هي : مسحوق البوليمر الجاف ، حبيبات مصنعة من نفس المسحوق، وقناني مصنعه من كلا الفقرتين السابقتين. كذلك تمت دراسة تاثير رفع نسبة (المثروم البلاستيكي للقناني : نسبة المسحوق الجاف) الى 25% وذلك باعادة تدويره 15 دورة متتالية . اظهرت النتائج ان عملية الرص والانصهار للبوليمر حصلت في جهاز البرابندر بدرجة حراره واجهاد قص ثابتين. وكذلك تم اعطاء ارتباطات لتوضيح النتائج التي تتعلق بالاستقرارية وخواص الانسياب. علاوة على ذلك ، تبين ان الاستطالة والصدم تعتمد على قوى القص المسبقة. In this research the effect of cooling rate and mold type on mechanical properties of the eutectic and hypoeutectic (Al-Si) alloys has been studied. The alloys used in this research work were (Al- 12.6%Si alloy) and (Al- 7%Si alloy).The two alloys have been melted and poured in two types of molds with different cooling rates. One of them was a sand mold and the other was metal mold. Mechanical tests (hardness, tensile test and impact test) were carried out on the specimens. Also the metallographic examination was performed. It has been found that the values of hardness for the alloys(Al-12.6%Si and Al-7%Si) which poured in metal mold is greater than the values of hardness for the same alloy when it poured in a heated metal mold at different temperatures or in sand mold. The strength and impact resistance for the alloys (Al-12.6%Si and Al-7%Si) are greater when these were poured in a metal molds than that when it poured in a sand mold. Furthermore, the higher cooling rates enhance the strength, hardness and impact resistance for the two alloys, while the low cooling rates reduces these mechanical properties. The percentage of elongation and the amounts of formed porosity decreased when the cooling rates increased درس في هذا البحث تأثير معدل التبريد ونوع القالب على الخواص الميكانيكية لسبائك (المنيوم – سليكون) اليوتكتيكية و تحت اليوتكتك. السبائك المستخدمة في هذا العمل البحثي كانت ( سبيكة المنيوم –٦, ١٢% سليكون ) و ( سبيكة المنيوم – ٧ % سليكون ). السبيكتين تم صهرها و صبها في نوعين من القوالب و بمعدلات تبريد مختلفة . أحدهما كان قالب رملي و الاخر كان قلب معدني . الاختبارات الميكانيكية (الصلادة ، أختبار الشد ، أختبار الصدمة) تم أجرأها على العينات. أنجز الفحص المجهري أيضا. لقد وجد بأن قيم الصلادة للسبائك (المنيوم –٦, ١٢% سليكون و المنيوم – ٧ % سليكون ) و التي صبت في القالب المعدني هي أكبر من قيم الصلادة لنفس السبائك عند صبها في قالب معدني مسخن عند درجات حرارية مختلفة أو في قالب رملي. المقاومة ومقاومة الصدمة للسبيكتين هي أكبر عند صبها في قوالب معدنية من تلك المصبوبة في قالب رملي. علاوة على ذلك ، معدلات التبريد العالية تحسن من المقاومة ، الصلادة و مقاومة الصدمة للسبيكتين بينما معدلات التبريد الواطئة تقلل من تلك الخواص الميكانيكية. أن النسبة المئوية للاستطالة و كمية المسامية المشكلة تقل عندما تزداد معدلات التبريد.